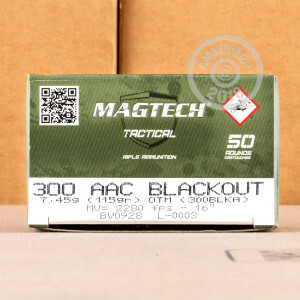 This 300 AAC Blackout cartridge from Magtech’s First Defense line of ammunition is designed in every way to give your rifle the accuracy it needs to trim the toenails off a vole from a few hundred yards away. It owes that ability to its 115 grain open tip match projectile, which is so uniformly dense in weight that you’d need a scientific laboratory to prove it’s anything less than perfect. This bullet’s hollow point meplat further protects it from wind deflection, so you couldn’t get a better bull’s eye unless you walked up to your target and stabbed it with your house key. These rounds’ first rate brass casings cycle through a semi-automatic flawlessly, and are just right for reloading. Their primers are very sensitive as well -- Magtech’s zealous commitment to quality control wouldn’t let them be any other way. 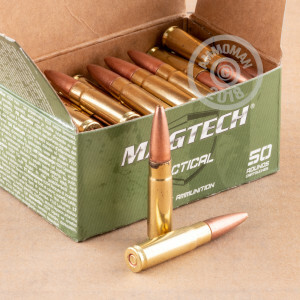 And don’t forget that we’re not just any man -- we’re the Ammo Man, which means we’ll ship this heaving box off cartridges right to your door free of charge. Why? Because that’s just the kind of thing the Ammo Man does.